Confession time: I had some extra card fronts from last year with the embossed branch and different languages already done. But I hadn't added anything hanging from the tree. Last year I used a silver and gold embossed world ornament. 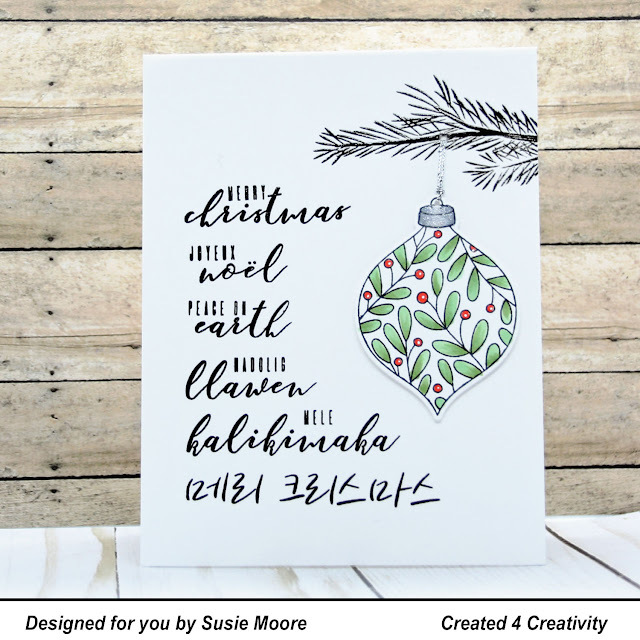 I had the new Pretty Pink Posh Decorative Ornaments stamp and die set in my pile of unused stamps and dies, so I grabbed this one and spent just a little bit of time coloring it with Copic markers. I have to say I absolutely love it. I plan to use some of these card fronts with all the ornaments from that set. I can't believe how simple it is and yet so pretty! OK - off to stamp some more! See you tomorrow!